Billy Wright was a fine right-halfback and later a superb central defender. While not the most talented player of his day, he was disciplined, dedicated, reliable, consistent, courageous, resourceful, intelligent and versatile, a wonderful sportsman on the pitch--never sent off or even cautioned--and unfailingly courteous and modest off it. Because of these qualities, he emerged after the Second War--an era desperately needing the escape sport and its heroes provided--as the most widely loved footballer in England. No player before or since has held such a universal grip on the English public's admiration. His unparalleled popularity lasted his entire Football League career, from the post-war resumption of league play in 1946 until his retirement in 1959. He became the symbol of and ambassador for the England team and English football in general. Essayist Jon Horne has written that Wright was "the sort of man who can only be spoken of in clichés." Indeed, Wright almost did it all. He captained Wolverhampton Wanderers to the F.A. Cup in 1949 and to three Football League championships in 1954, 1958 and 1959. The Football Writers' Association voted him Footballer of the Year in 1952, and in 1957 he finished second to Real Madrid legend Alfredo Di Stefano in the voting for France Football's European Footballer of the Year. He played for the national team throughout his entire career, from the first post-war match in 1946 to the last match of the 1958-59 season, and became the first player in the world to earn 100 caps, finishing with 105. Although players had to be one of the starting 11 to earn a cap because no substitutions were permitted and although the Football Association's international selectors often changed lineups on a whim, he missed only three of the 108 matches England played over his 13 seasons, two of them because of injury and all of them in the 1950-51 season. He captained the national team 90 times, a still-standing world record equalled only by Bobby Moore and apparently now unsurpassable. He led his national side at three World Cups, still another world record. And, finally, he played in 70 consecutive national team matches, all as captain, world records no one will ever equal, captain or not. Norman Giller's "official biography" faithfully traces Wright's achievement-laden career. It is as much autobiography as biography. Wright originally asked Giller, the noted football journalist, author and historian who had ghost-written Wright's weekly newspaper column during the 1960's, to collaborate on an autobiography. But Wright died of cancer at 70 in 1994, before the book could be written. Fortunately, Wright's widow Joy, one of the singing Beverley Sisters, agreed with Giller that the project ought not to be shelved and gave him access to Wright's extensive private collection of papers and mementos. Even more fortunately, Giller already had conducted lengthy interviews of Wright for the aborted autobiography. These fascinating interviews form the heart of the book. Giller takes us match by match through Wright's entire England career and, for the sake of completeness, even includes the three matches Wright missed in 1950-51. Each match is accompanied by the England lineup, Giller's account of the match highlights and then Wright's memories of the match and surrounding events. Along the way, Wright also gives his views on milestones in his club career. Giller puts it all in context through season-by-season summaries, which paint a vivid picture of football as it was half a century ago in a vibrant age of magnificent players and personalities. What emerges is an invaluable history of the England team of 1946 to 1959 from the perspective of its captain. The great events of the time--the fantastic victories of the great post-war side over Portugal and Italy, the first World Cup venture to Brazil in 1950, the first matches against Argentina, the watershed losses to Hungary, the 1954 World Cup in Switzerland, the resounding victories against World Cup holders Germany and heirs-in-waiting Brazil, the devastation the 1958 Munich air crash wrought on the national team, the World Cup in Sweden a few months later, the annually-renewed rivalry with Scotland and many others--are recounted from Wright's point of view. The book will bring back distant memories for those who witnessed a truly golden era of English football as Wright tells us about a dazzling array of unforgettable stars, among them Stanley Matthews, Frank Swift, Tommy Lawton, Raich Carter, Wilf Mannion, Tom Finney, Stan Mortensen, Jackie Milburn, Len Shackleton, Roy Bentley, Johnny Hancocks, Jimmy Mullen, Neil Franklin, Alf Ramsey, Nat Lofthouse, Tommy Taylor, Duncan Edwards, Roger Byrne, Jimmy Dickinson, Ron Flowers, Johnny Haynes, Bobby Robson, Bobby Charlton, Jimmy Greaves and Don Howe. More important, this book is a must-read for younger fans who have any ambition to know the English game's history. For their benefit, Giller explains that Billy and Joy were the David Beckham and Posh Spice of their time. But to those old enough to have seen Billy grace the world's football grounds and hear the lovely Beverley Sisters sing when they were chart-toppers, Becks and Posh are the Billy and Joy of their time, albeit they still have a long way to go to match Billy and Joy's accomplishments. Giller intended to write a tribute to Wright, and he has achieved that admirably. The book was plainly prepared with a great deal of affection by one who not only knew the game of the 1940's and 1950's but also was a friend of his subject. After a moving account of Wright's memorial service in Wolverhampton, which was followed by the private scattering of his ashes at the Wolves' Molineux Ground, Giller closes the book with three collections of reminiscences, from media figures who saw Wright play, from the fans and from his family and friends. Those who witnessed Wright's era are getting older now, and we are grateful that Giller has given us this finely-crafted piece of football history before memories of it are lost for ever. That is not to say that Giller ignores some saddening events in Wright's later life, his sacking as manager of Arsenal in 1966, his bout with alcoholism while he was a sports television executive and his life-ending illness. A teetotaller throughout his playing career, Wright began to drink heavily when his television job took him away from his beloved wife Joy and two daughters. He gradually descended into alcoholism, but with the help of friends, including Jimmy Greaves, himself a recovering alcoholic, he found Alcoholics Anonymous and sobriety, which he and Joy always regarded as his "greatest victory." "I could fill this book with stories of his drinking escapades," some of which were "horrendous, others hilarious," Giller writes, "[b]ut I refuse to rain on my hero" and "scar his portrait." Giller is surely right that it is enough to know Wright had an alcohol problem and that he beat it; further details are pointless. For once a football writer has the judgment to know where to draw the line and the forbearance to do so despite the temptation to boost book sales and gain sensational tabloid serialisation. We thoroughly enjoyed this book. It left us sorry we had finished it and wishing we still had to begin it all over again--the highest praise possible for any book. What we liked most is that it is almost exclusively about football--the game itself--and has very little in it about off-the-pitch peccadilloes. 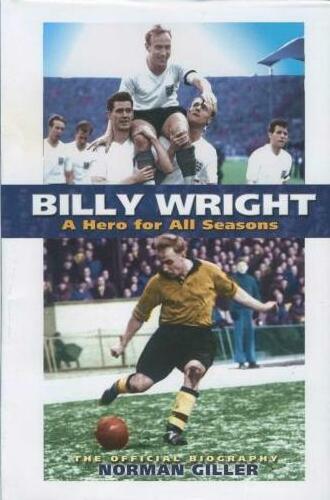 That, of course, is largely because of who its subject is--Billy Wright, indeed a hero for all seasons. Billy Wright: A Hero for All Seasons is available at most booksellers and may also be purchased through a website Giller has set up to honour Wright and promote the book. Fans may also contribute their tributes for publication on the website.